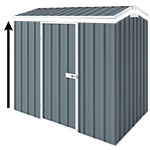 Our Spacesaver Shed range is the ultimate storage unit for those areas where space is limited. You can easily fit it under eaves and is large enough to store tools, sporting equipment etc. Ideal for storage in garages & carports and in unit complexes. You can add a number of accessories below, including flooring kit (that will eliminate the need for a concrete slab), shed blanket and a number of different shelves. Having spent 15 years living in London flats, our Cheap Sheds is our first ever shed. It may not be big & flashy like next door’s, but it does the job fitting in our DIY gear, garden tools and other bits and pieces. 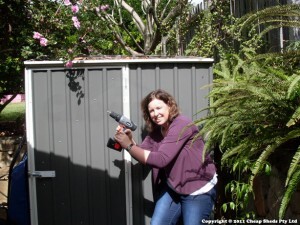 There’s also pride in knowing that we put up the shed ourselves – despite our DIY skills largely being limited to painting and putting together flat pack furniture. Our shed is a well used and loved addition to the house. It’s not a workshop, studio or a man cave, it’s just a small shed – but I feel pride whenever I look at it knowing that I managed to put it up largely on my own – with some small assistance from my sister.